The Aldosterone EIA kit is a colorimetric competitive enzyme immunoassay kit with results overnight + 1 hour. Application Notes: For the quantitative determination of Aldosterone in plasma, serum, and urine from any species. 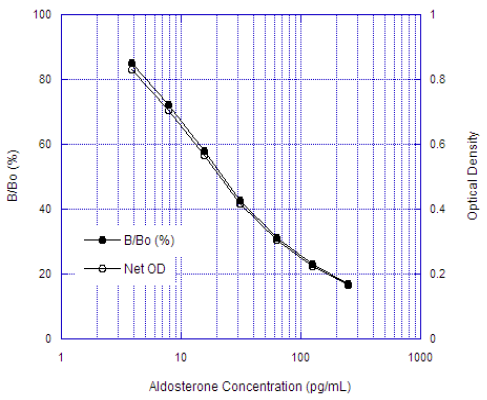 Scientific Background: Aldosterone is a steroid hormone synthesized from cholesterol in the adrenal cortex. Aldosterone is metabolized in the kidney and liver, and functions as the key mineralocorticoid in the control of sodium and potassium balance. Synthesis and release of aldosterone by the adrenal gland is primarily regulated by the renin-angiotensin-aldosterone system (RAAS), the main regulatory system involved in blood pressure regulation, renal hemodynamics, and sodium-volume homeostasis. Measurement of serum aldosterone in conjunction with plasma renin is used clinically to differentiate between primary and secondary aldosteronism. Primary aldosteronism (hyperaldosteronism) is characterized by a very low renin:aldosterone ratio leading to the retention of sodium and increased blood pressure, and is typically the result of renal gland hyperplasia or tumors. In secondary aldosteronism, hyperproduction of aldosterone results from external conditions such as heart failure and renal artery disease that reduce renal blood flow and stimulate the RAAS mechanism. The RAAS directly affects vascular and cardiac remodeling through proliferative and inflammatory signaling, as aldosterone and salt have been shown to increase the expression of intracellular cyclooxygenase-2, osteopontin, and MCP-1 in rats. Aldosterone acts by binding to the mineralocorticoid receptor (MR) triggering the transcription of hormone responsive genes, and clinical studies have shown that patients with congestive heart failure or after myocardial infarction benefited from MR antagonist treatment. As pharmacological modulation of nuclear hormone receptors is a common strategy for the treatment of cardiovascular disease, determining the effect of such treatments on the RAAS is of increasing value in evaluating the safety and efficacy of new targeted therapeutics.